For the eradication of knowledge. Including from sir Tony Abbott turdy. As medicare refused to pay. In grand and cakey style. In lingo of confused arse-end. Crap by day, and crap by night be. bugger-larceny — powered by a pair of boots. 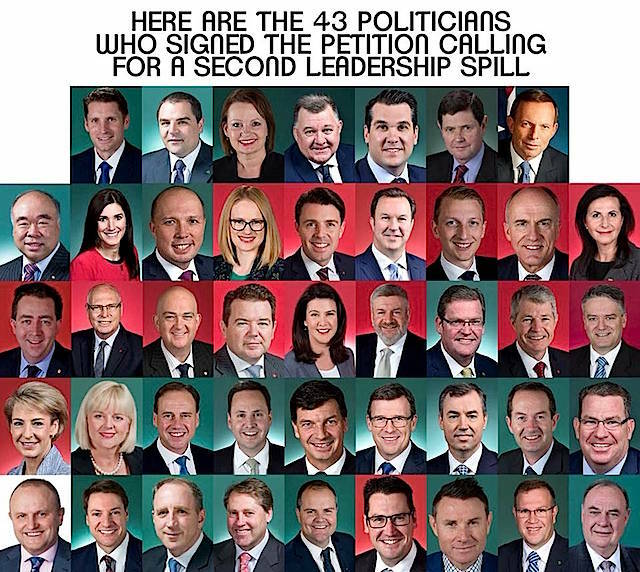 In a tweet from Fairfax reporter Bevan Shields, images of the petition showed three Queensland MPs had made notes next to their names. Warren Entsch wrote the number 43 next to his name, as he reportedly only agreed to sign the petition if it would get it over the line. Karen Andrews wrote “because this has to be resolved” next to her signature, while Scott Buchholz wrote “I support the office of the PM”. Frontbencher Paul Fletcher kicks off the discussion. "Cormann rumoured to be putting some WA votes behind Julie Bishop in round 1," he wrote to colleagues. "Be aware that this is a ruse truing [sic] to get her ahead of Morrison so he drops out & his votes go to Dutton. The recipients of the message include both ministers and backbenchers, and Christopher Pyne replied to say he had told Julie Bishop "very respectfully". Mathias Cormann has denied to the ABC that he was employing such tactics to knock Ms Bishop out of the race. The former deputy Liberal leader is yet to announce whether she will seek to retain a frontbench position, or if she will remain in Parliament at all. "Mathias Cormann has denied to the ABC that he was employing such tactics to knock Ms Bishop out of the race."??? Of course this was a tactic to eliminate MORRISON.